VulcanBay is a scalable Gigabit TCP test chassis that offers extreme performance for stateful traffic load testing, analysis and characterizing of Ethernet equipment and network infrastructure. It supports 1/2.5/5/10/25/40GE interfaces and can be used for simulating millions of real-world end-user environments to test and validate infrastructure, a single device, or an entire system. Vulcanbay offers stateful end-to-end testing of network appliances such as switches, firewalls, routers, NAT routers, proxies, bandwidth shapers, and more. The platform is also suitable to characterize entire network infrastructure performance. VulcanBay can be easily upgraded for greater performance thanks to Xena’s flexible licensing model which lets you easily upgrade VulcanBay by simply updating your license. This helps you protect your investment by spreading out capital expenditure across multiple quarters, and optimize your budget by purchasing additional performance when required. 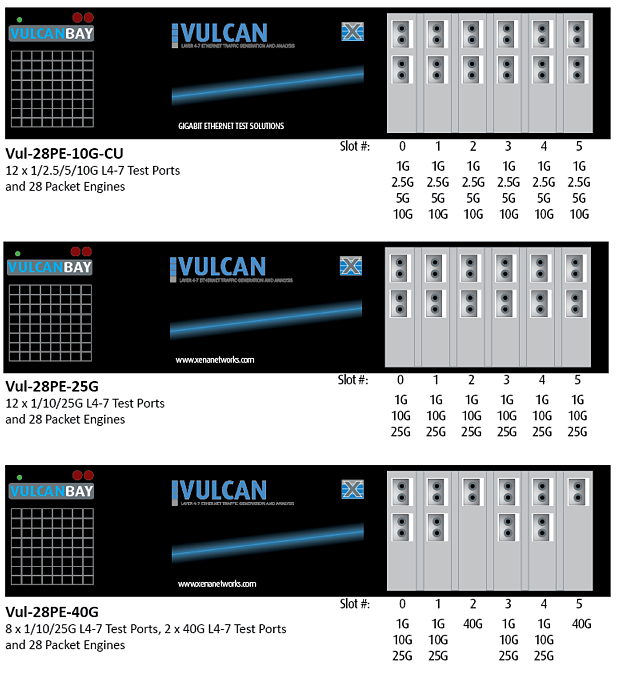 Equipped with 12 x 1/2.5/5/10G Test Ports (12 x RJ45 10000/5000/2500/1000 BaseT), and 28 Packet Engines. Equipped with 12 x 1/10/25G Test Ports (12 x 25GBASE-SR4/LR4 SFP28), and 28 Packet Engines. Equipped with 8 x 1/10/25G Test Ports (4 x 25GBASE-SR4/LR4 SFP28), 2 x 40G Test Ports (2 x 40GBASE-SR4/LR4/DAC QSFP+), and 28 Packet Engines.